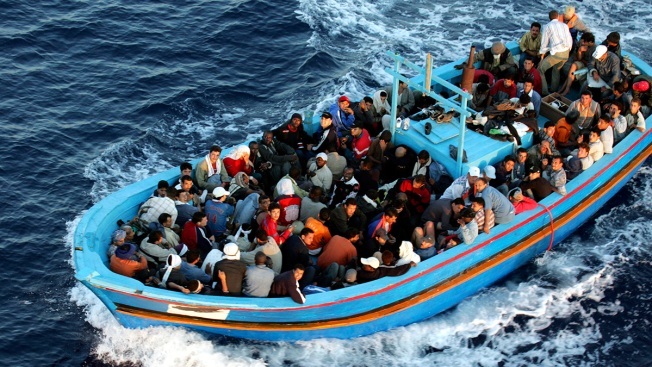 This June 21, 2005, file photo shows a boat loaded with migrants in Lampedusa, Italy. Greece is still grappling with the fallout of the 2008 debt crisis and a continual flow of migrants arriving on its shores, which have left an already-stressed welfare system struggling to cope, NBC News reports. Meanwhile, one migrant opted to return to his war-torn homeland after facing extreme hardship in Greece. Liza Schuster, an expert on return migrations to Afghanistan at City, University of London, said families often will have made a significant financial sacrifice to send someone to Europe and can be angry if they later show up on the doorstep. “You can find two, three, four, five, very angry brothers saying, 'We’ve put all of this together to save you and now not only are you not safe ... but we’ve got no future, we have nothing,'” she said.